This player analysis was originally posted on June 30th, 2015 for Grup14.com. It was written in the context of analyzing his strengths, weaknesses, and how he would fit into FC Barcelona at the time of the post. I have decided to repost the piece here for your enjoyment! Since moving to Juventus, Pogba has won the 2013 Golden Boy Award as well as the U-20 World Cup with France. The Golden Boy award is an award given to the best young football player in Europe, nominees must be under the age of 21 and playing in the top tier of a European league. Goal Impact measures the extent that a player contributes to the goal difference per minute of a team. If a player has a high GI value, then his team has a good goal difference when he plays compared to matches where he doesn’t play. An average player in my database has a value of 100. The best player in the world approximately 190. So what makes Pogba one of the most wanted young talents in Europe? His rectus abdominis, external oblique, pectoralis major, deltoid, biceps brachii and triceps brachii muscles all look quite developed – the core muscles help his balance and power through synergistic movements during the game while his strong arm and chest muscles also assist in holding opposition off, maintaining balance, and in swinging motions such as running or shooting. The 22-year-old Frenchman is roughly 190-centimeters (around 6 feet 2 inches) tall, weighs about 80 kilograms (about 176 lbs. ), and has long legs in comparison to the length of his upper body which is normal for taller people. Along with his long limbs he is quite strong – as shown by his musculature, even though he can give off the impression of a skinny or weaker player. His height and strength play a large role in his game and the way he makes his decisions during the match. For example, he is excellent at shielding the ball and a large amount of his dribbles involve having his body between the defender and the ball, making it extremely difficult for opposition defenders to dispossess him. Because of his lean muscular build, he is quick despite being so tall, which allows him to make dynamic dribbling movements and cover large amounts of space while maintaining strength and balance as he runs at opponents. Acceleration and deceleration play a large part in dribbling in general, but they are particularly important to his dribbling style. Similar to Cristiano Ronaldo, he is tall and strong without being too bulky where he would lose speed. Of course, his bones and musculature are different to Ronaldo’s in many ways (mainly in the lower body) – he certainly cannot match the winger’s speed in a sprint, which also plays a part in a player’s psychology and decision making. Even so, he has the agility needed to take many small steps while dribbling in order to quickly change direction and make decisions while unbalancing his opponents – though his dynamic movement when surrounded by many players is not at the level of Messi or Modric, who both have a lower center of gravity and are quicker, he is still quite good in congested areas as he relies more on combinations with his teammates to escape high-pressure situations. When Pogba reaches top running speed, his stride length assists him in covering large amounts of space. His capacity for dynamic movements coupled with his lengthy body allows him to perform many different dribbles as well as be able to press the ball and tackle the opponent very well. His height gives him a potentially “larger area of coverage” where he can cast a larger cover shadow than a player who is smaller than him – such as Pirlo. This also has some interesting effects on his passing (among other things) which I will elaborate on later in the piece. Busquets is another tall player who benefits in some similar ways. Despite lacking a low center of gravity because of his height, he maintains his balance in competition with opponents largely due to his strength and his tendency to use ball-shielding dribbles in which he uses a wider stance, making him much more difficult to topple over. Because his long legs act like levers, he has explosive power in his shots and his long passes. He is well known for the various long-range volleys he scored during his time at Juventus. He also has the ability to jump quite high, which in part leads to him winning most of his aerial duels (even assisting Morata’s goal at the Santiago Bernabeu with a leaping header over Ramos) and allows him to control higher passes better. Pogba is particularly talented when controlling the ball in the air with his chest, as he is able to rise above challengers and maintain his position due to his strength before showcasing his great ball control. Another interesting aspect of his body is his endurance, his body’s capacity to run at high intensity for prolonged periods alters how he plays certain roles on the pitch and which roles could be given to him. The young Frenchman is obviously quite athletic, but what about the techniques he uses? This aspect of Paul Pogba’s game is one of his best. He doesn’t perform penetrative dribbles very often but relies on his intelligence and technique in quick combination play when playing in between the opponent’s lines. His high positioning is more about shielding the ball and creating chances for his teammates while he balances their movements. His best dribbling and most controlling performances came from deeper areas where he could utilize his style of play better for the team. Pogba’s dribbling is highly focused on shielding the ball and keeping possession instead of trying to constantly beat players, though he often uses the opponent’s momentum against them in order to go around them when he is being pressed in midfield. It’s important to identify and describe some of his favorite and most frequently used dribbles so that there can be a better understanding of his style of play. This is one of the best and most popular styles in football, especially in Argentina. It is also Messi’s style of dribbling! The basic idea behind this style is that the dribbler makes the opponent tackle or move in one direction while the dribbler goes in the opposite direction with the ball. Using multiple feints, shoulder drops, and changes of directions in order to deceive the opponent and move into space are key characteristics of this style of dribbling. Pogba doesn’t use this in a very penetrative way as I’ve already mentioned, but during transition phases it isn’t uncommon to see him face up against a defender in a one-on-one battle and feint to go outside, then cut inside diagonally where he can create. It is visible here how when Pogba takes a touch backwards and has his body between the defender and the ball while cutting inside it is very difficult to gain access to the ball for the defender. From there he can play diagonal passes which are nearly unblockable from its source. Here, he played Caceres into a one-on-one situation versus the goalkeeper on the other side of the pitch. He normally uses the outside of his right foot to cut inside from the left side and move toward the center after a feint. Moving inside and using the outside of his right foot while his body is between the defender and the ball makes it incredibly difficult to stop him, especially when you consider his physical characteristics. From there he can create. Pogba often receives possession while touching the ball away from the defender and keeping his body between the defender and the ball. He begins by running with the ball, then slowing his running pace down in order to let the defender get into what seems like a good position to tackle the ball. Of course, he is using his strength and long legs to keep the ball a safe distance from the defender’s potential tackling range. When the defender is given the opportunity to “catch up” with Pogba and begins to attempt a tackle, the defender must slow down in order to attempt to dispossess him. This is the very moment when Pogba senses his opponent has slowed down and then he immediately accelerates away with the ball in a safe position while the defender is in the act of slowing down or attempting to tackle. This creates an extra few strides of space for Pogba to get away from his defender, which is a huge amount of space at this level of football. In this way he frequently creates space for himself to make decisions and to go by defenders without truly going directly one-on-one against them face on; he simply uses their momentum against them and their reactionary role as a defender to go past them. Here you can see Pogba letting the ball run across his body. Notice the defender was completely committed to where he thought the ball would go. His body is leaning in the opposite direction as the ball has already run across the past his body. His other leg is bent and ready to push off the ground and into the opposite direction to begin running. His head is already turned into the space. An important part of dribbling is what a player does before he even receives the ball. How a player initially receives possession can dramatically change the conditions around the ball in a big way. The timing of Pogba’s movements as he receives possession is excellent. He frequently lets the ball run across his body after committing a defender to his movement. When the ball is about one stride away from him as it’s traveling toward Pogba, he will then take a step toward the ball while dropping his shoulders and hips and putting his weight on his leg which is closest to the ball. Once the ball is about to run past his body he will lean in the opposite direction and push off this same leg and take his first more powerful step with his already bent leg which is facing in the other direction. Such a movement toward the ball will fool defenders into thinking he will move toward the ball and take his first touch in the direction from which the pass came. This takes advantage of defenders’ overly aggressive and anticipatory pressing movements in order to gain an edge over the opponent – defenders are normally simply reacting to what the player with the ball is doing, because the ball controls the game. Another interesting advantage which comes from doing this move is the fact that he is putting his weight on his near-side leg so he can use all of his power to start sprinting off in the opposite direction of his feint. As the defenders normally move toward the direction of his feint and he lets the ball roll across his body, they must react and change direction and then restart their running – while he is already running away with the ball. This gives him a very valuable few steps ahead of his defender and gives him space and time to make his next decision. There are variations to how he receives the ball on his far leg of course. He can let it run through without touching it at all if the weight of the pass is to his liking, he can let the ball run across his body, but take a touch with his instep on the receiving foot in order to control the ball and slow it down, or he will let it run across the face of his body and then touch a sharp and cutting touch into a new direction with the ball, usually in the opposite direction of the opponent’s momentum. This is a classic and underrated move – all a dribbler really needs is to be able to feint in one direction without touching the ball to fool the opponent and go in the other direction. I’ll talk about his body feints specifically while he is shielding the ball while the defender is on his back, as that’s normally the situation for him. This is advantageous because the defender doesn’t have a good view of the ball so he is mostly reacting to the dribbler’s body or trying to anticipate the dribbler’s moves, which makes it much easier to manipulate the pressing player. Pogba will face his entire body in one direction while taking a touch with the outside of his boot to the opposite direction for instance. The defender reacts to where he is turning toward while the ball is moving in another direction at that same moment. He will also use wider steps and feints in one direction while moving the ball with the outside of his foot toward the other direction. This has similar effects to when he faces his body in one direction and goes in the other, or when he does a step over in one direction and goes in the other; it commits the defender to a certain direction while he can begin moving in the opposite direction with a head start. Though he will normally feint in the direction of the opponent’s goal and then move toward his own goal where there is more space and less opposition players in order to escape pressure and maybe receive the ball again and face the play with time and space. This is a move which Busquets in particular has become famous for. This dribble is similar in nature to the “Acceleration/Deceleration” category as it allows the opponent to get “closer” to the ball before quickly moving the ball out of reach. This move is effective as it is a good way to move the ball backwards while still facing forward by just dragging it backwards with the sole of the foot. The opponent is baited toward tackling the ball and positions himself accordingly. Meaning the opponent is positioned in such a way that he is prepared to aggressively tackle the ball because it is directly accessible, not anticipating for it to move out of reach so drastically. The ball is maintained in control of the foot while moving away from the opponent and out of his reach – whereas a direct cut could be closer to the opponent’s tackling range. Rolling the ball in this way commits the defender into tackling the ball’s original position while the ball is being dragged further under the dribbler’s body and then bouncing out into a new direction. It is a great way of turning with the ball while committing a defender and opening space to move into. There are variations of rolling the ball as well. The ball can be rolled very quickly from one foot to another if the opponent is coming at a more direct angle, or the ball can even be dragged back and then bounced back into the same direction it was originally going to in order to commit the defender to the drag back and open up space straight ahead of the ball. Playing on the left this season for Juventus plays a large part in Pogba’s dribbling decisions. One of his main goals during his dribbles is to be able to cut inside of the field diagonally with time and space so he can shoot or pass, because of that he performs different dribbles in comparison to when he plays on the right side of the field, where he might have a more vertical orientation. For example, while he is on the left and being pressed from the flank toward the center he can turn with the ball with his inside leg which is a big difference to turning with the ball with his outside leg because of how long it take to turn as well as the safety of the ball. Being a right-footed player and turning toward the center from the left allows him to take many small quicker touches while turning instead of taking wider turns. Though when Pogba is pressed by a central player toward the outside he uses his right foot to turn with the ball toward the left meaning it’s a longer distance turn for the ball and a bit slower. It’s important to note that the direction of the turn can change in the middle of the turn with the use of feints and cuts as well. When Pogba is moving forward and wants to move his body into a position to face the goal diagonally but the simple cut inside is blocked (which is rare) and he doesn’t want to take the time it would take to make a wide turn all the way around with his right foot toward his left, he changes up his style of dribbling and does less shielding. He will frequently make a very sharp Cruyff-turn using his left foot moving behind his right foot and facing his body toward the inside of the field. This offers less protection as it’s only his standing foot which is protecting the ball and the change of momentum slows him down a bit, but it still puts him in a position where the ball can be on his right foot moving toward the center and facing goal with his body between the opponent and the ball. He is also very good at timing his movements: waiting until the defender is slowing down for him to speed up or waiting for the defender to gain speed for him to slow down. Normally he uses moves where he can shield the ball with his body and use the opponent’s momentum to bait them into giving up their defensive positions while he is already gaining speed in the opposite direction, but in this situation he will make a sharp cut which both slows him down and allows the opponent to stay goal-side of the ball. He does this or a simple feint and cut inside across the face of the defender in order to save time. The feint and cut inside mentioned in the “Gambetta” section is used much more often, as he can normally cut inside with ample space between him and his defender, even if he is facing his defender. A dribbler must actively measure how much risk should be taken and how quickly a certain position needs to be taken. Pogba will give up some of the safety he normally has when dribbling in order to move into a good body position more quickly or to go past a defender – which is needed in transitions and during the attacking phase of play. These are just some examples of how a dribbler’s decisions may change depending on his capacity to perform certain actions, his characteristics, where his team is, and which position he is in on the field. The techniques mentioned above are only some of his most frequently used dribbles, but he uses a mixture of many unmentioned ones as well, such as La Croqueta. In this aspect of his play he is quite aggressive in his choices but backs it up with good technique. If the shot on goal isn’t open for him in the attack, he will probably make the next most “aggressive” decision to move the team toward goal. In midfield he is more focused on retaining the ball, but he also plays some long and hard passes from deep areas too. His flair and confidence as a player is shown through his decisions and attitude on the field. This flair and confidence leads to many “flashy” passes, but ones which are effective. If he is playing high up the field next to the strikers (which is normal in his role on the left for Juventus), he will make many runs toward wider areas. If a defender is following his run he will frequently attempt backheel lay-off passes into the opened space which the defender following him left open. This surprises many defenders as everyone expects the ball to move into the direction Pogba is facing, so the backheel pass opens a lot of space as the defenders gather around Pogba and then react late to the lay-off pass for his oncoming teammate who is facing toward goal and running in stride. He doesn’t only use this type of pass in this situation either, he will frequently play backheel passes while he is shielding the ball or within combination play to unbalance the defensive structure. Benzema recently had a backheel assist to Ronaldo in a Clásico which displayed the valuable effects of a backheel layoff. These types of passes are particularly valuable as they are easily hidden and can be executed quickly. He not only plays passes with the outside of his right boot when switching from right to left, he also plays vertical passes in the same way. This is not only a good way to hide a vertical pass, but depending on the direction of his movement it can fool the defense as well. Because of the direction of the curl on these passes they can be the best pass to play depending on the situation, like in specific combinations. Similar to Dani Alves’ assist to Messi against PSG under Tito, Pogba will play diagonal through passes with the outside of his boot if he is on the right side. As he is not facing directly forward and is usually around the halfspace, the defense can open up to these sorts of passes. This type of pass can also be used when a player needs to be led in a certain direction, as there normally is a lot of curl on the pass. Pogba is adept at leading his teammates into good zones and intelligently conditioning them to make specific decisions based on his pass communication. For example, if he switches the ball and the pass is behind the winger, then the winger will have a different set of possible decisions he could make in comparison to how his decisions could look like if the ball was played in front of him. Same picture from earlier, showing his diagonal playmaking. He plays these types of passes very frequently as he is constantly cutting inside on his right foot. Diagonal passes have the advantage of cutting both horizontal and vertical lines of the defense while both gaining space and switching play. Another interesting aspect of these types of passes is that they can be used as a long attacking pass even against a very deep defense, because a vertical pass wouldn’t shift through many zones against a deep defense, but a long diagonal toward the far post covers a lot of ground and makes even a deep defense shift across space and creates potential for mistakes. When he cuts inside from the left side he normally will have a lot of teammates running toward goal on the far side of the field, so his diagonal passes are quite valuable in those situations. He intelligently puts curl on them or drives them directly depending on how fast the pass must get there and how he wants to lead his teammates. In the same way, he will use chipped passes over the defense to his teammates who are running through. These are normally diagonal as well, but just a variation depending on how close the player he is aiming at is to him and how much space is behind the defense. Pogba’s chipped passes are normally timed quite well and are expertly weighted so they do not stay in the air too long. His selections of crosses are surprisingly good. He doesn’t play long and high crosses into the box aimlessly (which most crossing players tend to do), but he tries to create a situation where he can play a hard and low pass into the box whenever he can. He normally seeks to play cutback crosses into the penalty box which are particularly advantageous as they attack the defense by moving away from the goal, using their own momentum against them. Sharp low crosses across the face of goal as well as cutback crosses near the top of the box are likely two of the most efficient ways to score goals. He is not afraid of using his left foot for crosses (or for shooting, for that matter) either. When he cannot find the opportunity to play a low and hard cross into the box he will normally play a long diagonal toward the far post where his teammates on the far side are likely rushing in to overload the defense. He always looks for a higher percentage cross, and if he cannot find the opportunity for one he will play the ball back. Remember how I said it’s very difficult to block his diagonals because of his body position? It’s reminiscent of how Dirk Nowitzki shoots his fade-away. After watching it, do I need to say more? As he is often in supportive positions and doesn’t normally get into one-on-one situations against the goalkeeper, I will talk about his long shots. This part of his game can actually be seen as a weakness to some. Because he is so confident, he shoots very often when he has space within 30 meters to 35 meters of the goal. As long shots are so inefficient it can be seen as a waste of possession, when he could continue circulating the ball to create a potentially better situation instead. Most people normally view long shots as good and impressive outcomes, but the truth is most of them miss the goal. It usually just gives the possession back to the opponent, though it does allow his defense to set back up into shape as the game would restart as a goal kick, so it provides positional stability in that sense. That being said, his shooting technique is very good. When cutting in from the left side he will frequently look to curl the ball inside of the far post, other than that he normally drives through the ball and hits it with his metatarsals (laces region) with good body shape – leaning over the ball, hips and feet facing toward the target, arms out for balance, and knee over the ball while striking it. If he took shots from closer to goal – just outside the penalty box being the farthest he would shoot from – he would have many more goals. His volleys are also technically very good. The various volleys he scored while at Juventus have become famous on the Internet! He understands how to “slice” through the ball correctly in order to get the appropriate spin while not being too powerful. The key to most volleys is not to hit it “as hard as you can” but to not put too much power on it and accurately guide it into the corners of the goal. You can see in most of his volleyed goals he doesn’t follow through as aggressively as one would for a normal shot. He also has great balance and body position in the variations of volleys that he attempts. A look at some of his best long-shot goals, most of them being at the edge of the penalty box! Pogba’s long, athletic body gives him some unique advantages in this department. As I mentioned earlier, the cover shadow which he casts is larger in comparison to smaller players such as Pirlo. His long legs are particularly advantageous for intercepting passes and tackling balls which would normally be out of reach. Coupled with this, he intelligently blocks passing lanes while he presses the ball. Before he moves out to press the player on the ball he will look to make sure his cover shadow covers at least one opposition player (usually in the center). Because of his athleticism and anticipation he is able to “jump” the dribbler’s route of movement – meaning he can press the player on one side, but he will have anticipated the dribbler turning in the opposite direction and jumps in that direction earlier than normal so he can have better access to the ball, and he does so quickly. He can change directions very quickly and his height makes it difficult to feint and move around him as his reach is longer than normal, so he frequently pokes the ball away, especially on his slide tackles. Of course his aggressive style of pressing can lead to him being bypassed at times, but his defensive attitude once he has been bypassed is impressive. His tackles during backwards pressing are very good due to the above-mentioned aspects, but his willingness to backward press is most valuable. Whenever he loses the ball or is tackled to the ground, he seems to get “angry with himself” and immediately gets up hastily and runs back to support the team defensively – not exactly a technical aspect, but nice to see. In counterpressing and in defensive shape he has a good understanding of his positioning within the team’s structure and how to provide proper cover at an angle and from which angles to press from. In the act of tackling and shielding off the ball he is strong and aggressive, and he isn’t scared to slide tackle the ball when running from behind or putting his body in dangerous positions as he is quite confident he will reach the ball and take it away. 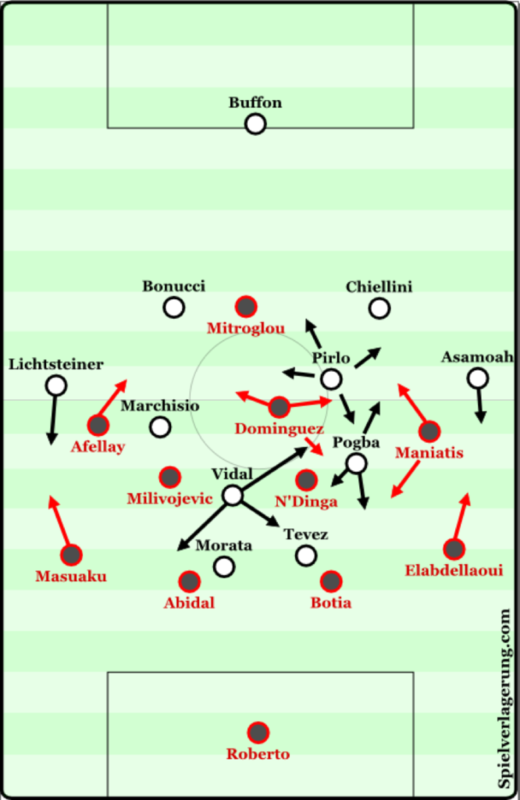 Pogba’s role in the home game against Olympiakos in the 2015 CL. His movement within the current Juventus team is as the left No. 8 closer to the box acting nearly as another striker or winger at times. When he moves into the high areas where a striker would usually play, he uses his good shielding of the ball and creativity in combinations to help the team penetrate the defense. In possession he intelligently positions himself in relation to the opponents and his teammates. Normally players will move toward the ball when asking for it, but Pogba will move wider or away from the ball because he understands that if he is farther from the ball but can maintain connection with the player passing it to him that he can find larger amount of space and penetrate the defense. Normally he will position himself around the halfspace, then when the ball is moving across the field for the switch he will move wider into the halfspace in order to provide a great option for the switch which is still quick, but still long enough that he can receive in a space where there is more time and he can make better decisions. The halfspace has many space-opening effects of course, so him playing in such an area is definitely advantageous for Juventus. He normally seeks to cut inside from deeper areas in the halfspace and move toward the goal diagonally as a playmaker. His best moments come when he is in deeper areas and has the ability to use his shielding and dribbling to keep the ball and can make the creative decisions for the team when starting the attacking phase, rather than being positioned high and within the opponent’s formation. When in deeper areas he can play the initiating vertical pass into the penetrative combinations, and he normally has good decision making in this regard. When he is positioned within the opponent formation he is normally binding the defenders and opening up the space, he is normally positioned in midfield so that Tevez can drop deeper and create, or so that Pirlo or Vidal have a larger area to move in freely. His combinative play and understanding is excellent. 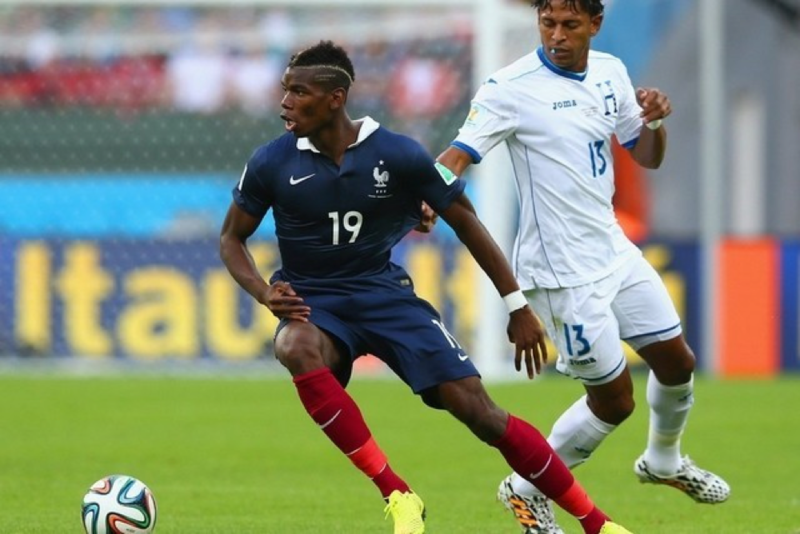 Pogba looks to solve situations using his teammates in combinations rather than dribbling. If he is played in a role where he must be high up near the strikers he will likely be receiving the ball with his back to goal and bouncing it into other players as lay-off passes. He uses backheel and outside-of-the-boot passes very often within combinations and his lay-off passes. He normally takes a supportive role within combination play and seeks to balance his teammates’ movements and allows them to penetrate the defense while he is usually the one to play the pass which leads to the penetration. His understanding of where to place his lay-off passes to be is excellent, so is his timing. If Pogba could have a role in which he plays deeper he could control the tempo as he focuses on maintaining possession and then makes the initial penetrative pass before moving into a supportive angle so that he can play his teammates through the defense. His ability to play a variety of passes with long range, his pressure resistance, his athleticism and his decision making means he would fit perfectly in such a role as opposed to a role where he positions himself high and within the opponent’s formation. His endurance allows him to play roles which cover a lot of ground as well. He is normally making constant far-side runs behind the defense for his teammates, and with that sort of running ability he could easily have a very present role in the team’s possession in both buildup and creation. Overall, Paul Pogba is a very talented young player who has some minor weaknesses such as his decisions to shoot and his pressing resistance when surrounded by multiple players (which is hardly a weakness). His characteristics seem to fit perfectly for a role as a deeper central midfielder rather than a focal point of the attack. Ironically, as I’m writing this for Grup14, a website dedicated to FC Barcelona, I can’t help but think that Pogba would be a very good fit for the current team in the left-central midfielder role where Iniesta plays. He would balance the roles of Alba and Neymar while being able to control the possession and make decisions in deeper areas before moving into the attack. His far-side runs would be interesting in tandem with Messi’s diagonal play from the right flank. Is it likely he will join Barcelona? Who knows. Though the possibility is exciting and FC Barcelona are likely the team which would fit him and the rest of the players in the squad the best. There is currently a lot of transfer rumor talk around the 2013 Golden Boy winner, and he has just recently played in his first Champions League final at the age of 22. Wherever he goes and whatever he does, he definitely has a bright future! 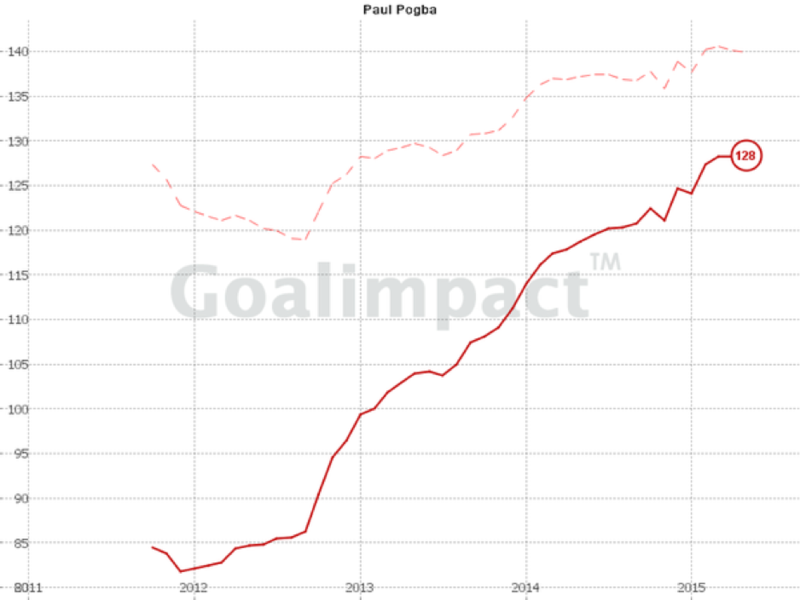 I would be intrigued to read a write-up from AO on how Pogba has progressed/stalled since. While he is now a World Cup winner, his form since his return to Manchester United has varied significantly, and he shows no signs of becoming a deep lying midfielder as suggested. He operates best for the national team when alongside the magnificent N’golo Kante (who wouldn’t? ), but has struggled to dominate games at United since Zlatan Ibrahimovic’s departure – they linked up tremendously. Is it that his midfield partners (Matic, Herrera, McTominay, Fellaini) are not up to scratch, or is Pogba more to blame for United’s erratic form? Can he turn it around at United, or are the issues too manifold? Would Barcelona be interested were he to leave Old Trafford? Where, truly, is his best position? I think Mourinho is the Problem. The other midfielders are great players (especially Matic and Herrera) but they won’t perform well without a coach to coordinate and orchestrate their efforts in possession. Mou showed those qualities in the past but has since turned to a very onesided way of setting up his team. Buying ballplayers by the dozen and then expects them to play against their strengths by purposely gifting the ball to the opponent. No team will be successful on toplevel while completely neglecting one side of the game. Pogba’s attacking ability is amazing, long pass and long shoot are execellent! In the World Cup 2018 Final, he did a crazy pass to Mbappe. I don’t think he would really fit in these particular roles. He is a good dribbler, but very different from Modric and Iniesta in his style and physique. He also likes to play pretty attacking passes which could end up in a lot of turnovers given his sometimes weird decisionmaking (sometimes he could carry the ball longer instead of punching it forward). He could be a perfect partner for a player like Modric or Iniesta (in a pairing of two No. 8’s infront of a lone No. 6 – e.g. Kroos, Weigl or Busquets) because he offers a different approach on progression (more direct), an aerial threat and a high defensive workrate (including his physical dominance) without lacking ballhandling skills (which distinguishes him from the likes of Casemiro, Mascherano or Bender). 105+ Mio.€ is a very strong point on why he made his move back to United. Neither of Barca and Real (or any other continental team) would want to pay that much for an unfinished somewhat defensive midfielder. If he was a forward or at his peak (that means a lot more stable than in his Juventus seasons), they woukd have made a move for him after all those rumours. Sorry if the sentences got a bit messy – my English gets worse and worse after a few beers????. I agree that both Barca and Real could use his physical dominance in midfield but personally I wouldn’t sacrifice Modric or Iniesta for it. At Real I would bench Casemiro and play Kroos as the lone pivot, at Barca he could at times play instead of Iniesta (because he can’t play as many games anymore), but I would mostly throw him in instead of Rakitic/Rafinha/Gomes.